The kind of sunny, scorching weather which January has brought with it, has often made me dream of lounging by the beach somewhere in Thailand, dosing off under the shade of coconut trees, feeling the balmy breeze against my skin, and looking forward to Tom Ka Gai at dinnertime. But since I’m not about to be jetting off anywhere, I thought the next best thing would be to cool off on the terrace with a glass of Lemongrass and Ginger Iced Tea. Lemongrass is believed to have medicinal properties. It’s used in traditional remedies in Asia, for treating fevers, coughs and colds. It is also believed to aid digestion, cure insomnia, keep skin healthy, act as an antioxidant, keep cholesterol levels down, inhibit heart disease and even induce programmed cell death in cancer cells! But quite apart from all of that, I love lemongrass for what it is. I love its fresh, citrus-like fragrance, which always manages to relax me. I love how it lends that tangy, exotic flavour to cooking. 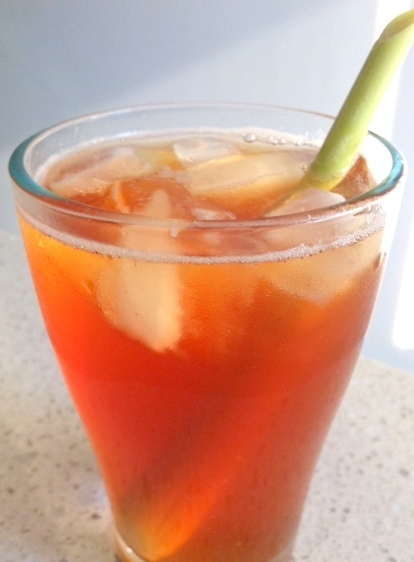 Most of all, I love how a whiff of lemongrass reminds me of luxuriating at spa resorts, where time seems to stand still.So if you’re thinking of beating this heat with a glass of Lemongrass and Ginger Iced Tea yourself, here’s the recipe. Enjoy! In a pot, boil lemongrass and ginger in 1 cup of water for about 10 minutes, then add sugar. Cover pot and leave aside for about 30 minutes, or leave overnight in fridge. Strain the lemongrass and ginger syrup, pressing on the ingredients to extract the flavour. Let teabags steep in 1 cup of boiling water for 5 minutes, then add 1.5 cups cool/cold water, and remove and squeeze out teabags. Mix syrup with tea, pour out into 3 glasses. Put a stalk of lemongrass into each glass and add ice cubes.